Pros: A double bill of interesting pieces of opera, powerfully performed. Cons: Difficulties with the sound mean you lose some of the first piece, whilst an overlong second piece resulted in a restless audience. An engaging evening of opera that's perhaps not the best choice for newbies to the genre. 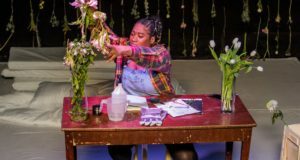 The Wanton Sublime and The Medium form a challenging double bill, and are part of the Arcola’s Grimeborne festival. 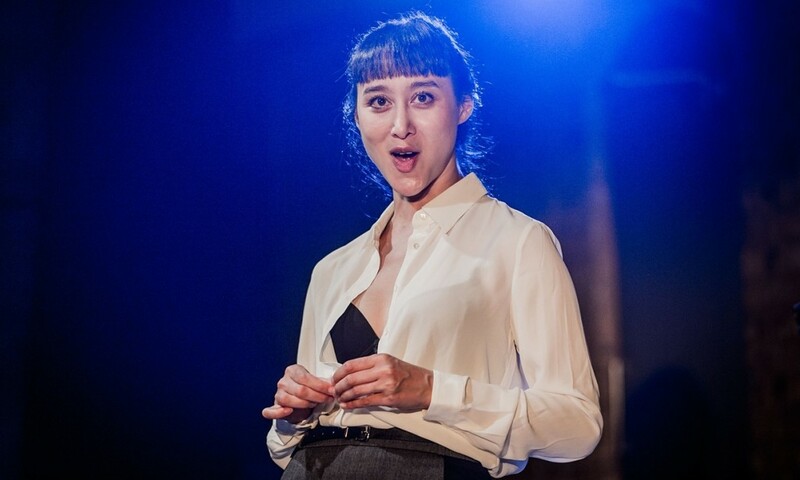 Launched in 2007 with the aim of introducing opera to new audiences, the festival sees productions of new or rarely performed opera in both spaces of the Arcola theatre. The Wanton Sublime and The Medium are performed in Studio 2, on a tiny, white stage, and this incredibly intimate setting for the performance has both positive and negative consequences. The Wanton Sublime, an American opera seeing its European premiere, is a re-imagining of the Virgin Mary and the annunciation story. 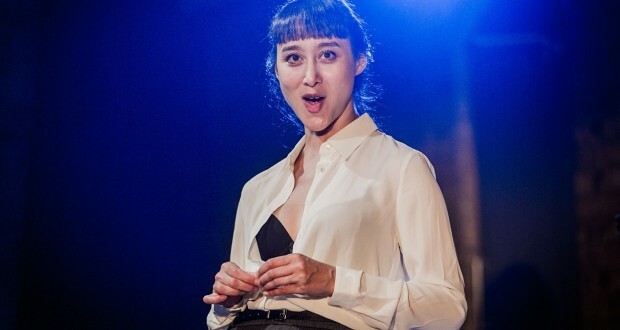 This modern take sees an unhappy and angry Mary, performed excellently by Hai-Ting Chinn, challenging the voice which informs her of what is to come. I found the moments where Chinn sings against her own, pre-recorded voice especially moving, but her entire performance is very powerful. The Orpheus Sinfonia, conducted by Andrew Griffiths, are stellar. Unfortunately, however, the combination of the small space and the orchestra being placed on either side of the stage meant that I lost quite a lot of what Chinn was actually saying – a fact that must have been especially annoying for Anna Rabinowitz, the librettist, who was watching the performance the night I saw it. It’s especially frustrating because the music didn’t seem too loud for the space, so I can’t help but feeling that perhaps a better staging would have had better results. Regardless of this problem, it remains an interesting piece. The audience watch as the suited Mary strips down to her underwear before rebuilding herself in a modern day version of the traditional garb – a blue dress, complete with coral and gold jewellery and long flowing hair – whereupon, despite her protestations, Chinn’s Mary accepts her lot, just as so many of us are expected to do. The other piece, the unaccompanied The Medium, sees Chinn as a medium who starts by reading the fortune of several members of the audience, before becoming wrapped up in her own experiences. Several characters appear and seem to inhabit the medium, and it is impossible to know if these are meant to be genuine spirit experiences, previous traumatic events playing out, or the result of some sort of psychosis. Whatever the cause of these different characters, Chinn tackles them well, transitioning from one to another too seamlessly at times. Aside from the lack of instrumental accompaniment, The Medium is accessible musically, and in the small performance space the tension and claustrophobia of the medium’s experiences are easily communicated to the audience. Having said that, its running time of almost 50 minutes is too long – a fact made all the worse by the slightly uncomfortable bench seating of the studio. In watching another woman forced to confront an unusual spiritual or psychological situation it does, however, make for a good accompanying piece to The Wanton Sublime. 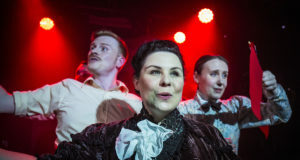 The Arcola, located in gritty Dalston, is in stark contrast to the Sussex opera institution its festival is referencing, and I hope that they continue to do the great work in giving more people access to opera. I’m just not sure that these two shows would be the first thing I took them too!